The Vikings closed out the regular season era of outdoor football at TCF Bank Stadium as they dominated the New York Giants 49-17 on Sunday Night Football. The win clinched a playoff berth for the Vikings and sets the stage for a NFC North division title game at Green Bay next week. The Vikings closed out the regular season era of outdoor football at TCF Bank Stadium as they dominated the New York Giants 49-17 on Sunday Night Football. The win clinched a playoff berth for the Vikings and sets the stage for a NFC North division title game at Green Bay next week. Minnesota jumped out to a 10-0 lead after a 32-yard field goal and a 28-yard touchdown from Teddy Bridgewater to Kyle Rudolph. From that point on, they never looked back. Harrison Smith and Captain Munnerlyn both corralled interceptions and Smith returned his for a touchdown. Jerick McKinnon added two rushing touchdowns, Adrian Peterson added a score, and Blair Walsh booted four additional field goals. It was the most points scored by a Minnesota offense since 1998 when they scored 50 against the Jaguars. The Giants lone points came from a field goal, a long touchdown to Rueben Randle, and a late touchdown from Ryan Nassib to Myles White. On the Randle touchdown, Terence Newman was beaten and Andrew Sendejo couldn't make the tackle over the top as Randle ran to the end zone for a 72-yard touchdown. This was about the only blemish from the Vikings defense. They corralled three takeaways and kept the Giants offense in long down situations. The pass rush frustrated Eli Manning and forced him into some errant throws. The Vikings offensive and defensive units are hitting stride as they close out the season. Not to mention, this late surge has put them in a position to win the NFC North in Week 17. Their ability to play dominating team football over the last two weeks is encouraging as they travel to Lambeau Field for a matchup with a Packers squad that is in ruins after a 38-8 thrashing by the Cardinals last week. Teddy Bridgewater continued his success in the month of December as he completed 15 of his 25 attempts for 168 yards and a touchdown. In seven career December games, Bridgewater has a 71.5 completion percentage, 12 touchdowns, and just 5 interceptions. He perfectly placed a throw in the seam to Kyle Rudolph for a 28-yard touchdown and nearly completed a touch fade to Mike Wallace in the corner of the end zone. Bridgewater's accuracy and pocket presence have been superb over the last three weeks of play. After a rough game against Seattle, something clicked for Teddy in the Thursday night game at Arizona. He's willing to make the tough throws when he needs to and doesn't look afraid to make a mistake. Bridgewater doesn't need to notch 200 passing yards every week, but he has to make the throws necessary for the Vikings offense to be more balanced. Recently, he has executed well and it has allowed Minnesota to outscore their last two opponents 87-34. Scoring 49 points was aided by a few defensive turnovers, but the Vikings offensive still had to find ways to create points. Not to mention, it was the most scored by a Minnesota offense since 1998 when they scored 50 against the Jaguars. The offense is catching stride during the home stretch of the season and it's encouraging as they travel to Green Bay next week with the division title on the line. 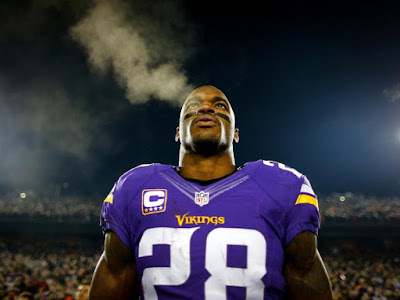 Adrian Peterson carried the ball 22 times for 104 yards and a touchdown. He enters the final week of the season 64 yards ahead of Bucs running back Doug Martin for the NFL rushing title. Peterson continues to run fierce and has shown more patience as he searches for lanes. Over the last two weeks, he has been complemented nicely by running back Jerick McKinnon. McKinnon rushed for 89 yards on seven carries. He added two touchdowns and is starting to carve out a role in the offense. McKinnon turned on the jets as he busted lose for a 68-yard touchdown in the late stages of the fourth quarter. He also plunged into the end zone for a 7-yard touchdown off of a toss play earlier in the fourth quarter. He has been featured more in the Vikings' offense recently and it has led to more success. Norv Turner called a jet sweep earlier in the game to McKinnon and his 31-yard touchdown run was called back as Matt Kalil was called for a false start. The offense will continue to feature McKinnon moving forward as he uses his athleticism to supplement the tough running style of Adrian Peterson. The Vikings running game is clicking and it's spear-headed two consecutive offensive outbursts. After missing the last three weeks, Harrison Smith, Anthony Barr, and Linval Joseph all returned to action. Smith played the most snaps (46), while Barr (39) and Joseph (34) played over half of the 62 total snaps. They weren't limited much as they returned from injury. The defense surrendered just 17 points for the second consecutive week and tallied three interceptions. Early in the game, Andrew Sendejo added an interception off a tipped pass. Late in the second quarter, Harrison Smith corralled an overthrown pass and returned it for a 34-yard touchdown. Finally, Captain Munnerlyn nearly had a return touchdown in the third quarter, but was stopped at the four-yard line. The Vikings defensive backs capitalized on Eli Manning's errant throws and the pass rush helped keep him on his toes. For the most part, the defense set the offense with a short field. They kept the Giants deep in their own territory in long down situations. The average drive start for the Vikings in this game was at their own 44 yard line. The Vikings aggressive and sturdy defense has allowed them to put their offense in the best possible situations. Having three of the better players back on defense will only continue to help the Vikings as they travel to Green Bay and later open the playoffs. The Vikings continually sacked, pressured, and hit Eli Manning in this game. He had minimal time to make any throws up the field. Minnesota had just four total sacks, but got to Manning and hit him hard on several occasions. Tom Johnson notched a pair of sacks, while Danielle Hunter and Brian Robison each added one. Hunter is second in sacks among rookies and continues to emerge as a major pass rushing threat for this defense in third down situations. The Vikings' aggressive pressure forced Manning to rush and make mistakes. In turn, it provided more opportunities for the secondary to make plays in the back end of the defense. Manning launched several passes that were errant and quick. The Vikings will continue to apply pressure as they travel to Green Bay next week. The Packers offensive line is in ruins and Rodgers was sacked eight times yesterday in a 38-8 loss to the Arizona Cardinals. The Vikings defensive line will need to apply pressure and the secondary has to be opportunistic again. After knocking his first extra point off the upright, Blair Walsh settled down and hit five total field goals. He booted two 50+ yard field goals (53, 52) and connected from 22, 27, and 32 yards out. Walsh has found his groove when kicking field goals, but has missed four extra points this year. He needs to learn how to hit these because one point can be the difference in the playoffs. Nonetheless, his ability to capitalize after making a mistake early is encouraging for Walsh as he moves forward. The Vikings special teams coverage units continue to perform well and Jeff Locke shifted the field nicely with two nice punts inside the 10-yard line. The Vikings have a team goal to win the NFC North and they'll have a chance to win next week and make it a reality. In week 17, they travel to Green Bay to square off with the Packers at Lambeau Field. The Packers defeated the Vikings 30-13 at home in late November, but Minnesota is playing their best football down the stretch. The game has been flexed to Sunday Night Football and it's tough to believe the Vikings won't be ready for huge clash with their arch rival. Terence Newman left the game with an illness and Matt Kalil exited with a foot injury. Kalil had x-rays but they came back negative.